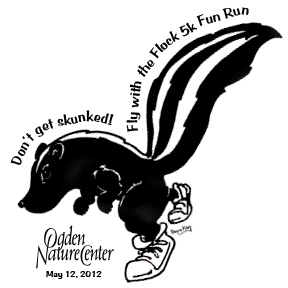 FLY WITH THE FLOCK 5K FUN RUN / 2.5K KIDS RUN and PANCAKE BREAKFAST at the OGDEN NATURE CENTER Registration is now open for the Ogden Nature Center's 10th Annual Fun Run & Pancake Breakfast slated for Saturday, May 12. Runners and families are invited to enjoy the great outdoors and a lively morning at the Ogden Nature Center. Staff will be on hand to introduce live birds of prey and other native animals. Union Grill will cater a scrumptious pancake breakfast with coffee by Grounds For Coffee. Awards, prizes and kids activities will follow the race on the back lawn of the Visitor Center. Registration fees are $22 for adults and $14 for children under 12. After May 5, late registration fees are $27 for adults and $16 for kids. T-shirts and up-cycled goodie bags are guaranteed to those who pre-register and all participants will be entered to win prize drawings. Start time for the run is 8:00 a.m. Last-minute registration will be held between 6:30 and 7:30 a.m. the day of the race on a space available basis. The 5K course is two laps winding through 152 acres on dirt trails. Children under 12 can run a 2.5K and young children can participate in a free, 100 foot kids dash with medals for every child who participates. Please note: walkers will not be timed for medals, but are welcome and encouraged to participate. Please dress appropriately. The Fun Run will be held rain or shine. All proceeds will directly benefit the Ogden Nature Center. Special thanks to our generous sponsors -- the L.S. Peery Foundation, Striders Running Store, UTA Rideshare, Zions Bank, McKay Dee Hospital, America First Credit Union, The Standard-Examiner, Grounds for Coffee, Union Grill and Idlewire Pet Care. To register online, go to www.ogdennaturecenter.org. To register in person, go to the Ogden Nature Center, 966 W. 12th St., Ogden, Utah or call 801-621-7595.